Imagine being invited to a street party where the guest list included Beyonce, Kanye West and Michelle Obama. That's what artist Justin Richburg thinks Childish Gambino's latest music video Feels Like Summer is all about. And he'd have a better idea than most, given he's the person who illustrated it. Justin's art is normally found on his Instagram. Childish Gambino is clearly a fan. "It started with my drawing, Dice Game," Justin tells Newsbeat. Dice Game is the name of one of the viral cartoons which caught many people's attention earlier this year. It featured cartoon versions of Barack Obama, Malcolm X and other iconic black figures playing a dice game with money and alcohol. 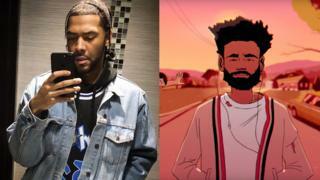 The image was later referenced in US comedy series Atlanta, which would be Justin's first encounter with Childish Gambino, aka Donald Glover, who created the show. "They asked me to use it for the episode," Justin explains. "A few months later his team reached out to me to work on the music video." Justin started working on Feels Like Summer after Gambino's This Is America came out - but didn't let the pressure of that video's success get to him. "You get excited for a little bit but you've got to remember that this is your career so you can't get overly hyped. You've got to keep your professionalism." Childish Gambino's video consists of black hip hop artists interacting with each other in a make-believe neighbourhood. However, if you've been anywhere near social media you probably haven't escaped all the theories people have drawn up about the video. Some fans have drawn parallels with the crying version of Kanye West - saying it portrays some of his recent political statements. Others have drawn links between cartoon Nicki Minaj's interaction with cartoon Travis Scott and recent tweets from the self-proclaimed queen of rap. However, Justin says the animation of Nicki and Travis was actually drawn up long before she blamed Travis for her album not reaching number one in its first week of release. "When we were first looking at the Nicki and the Travis Scott thing, it was done a while ago," Justin explains. "So with that, it just happened to be a coincidence when she started going on her tirade against Travis Scott." Justin says the video doesn't have a particular meaning - but he does have his own interpretation. "The concept of the video is that you're just walking down the street on a summer day while the sun's going down. "Something like that just happened to be random because anything could be happening down a block. "It was basically like a block party that Childish Gambino is walking from." From a young age, Justin had wanted to get into art. He had planned to go to art school after high school but was diagnosed with schizophrenia. He told how an early diagnosis helped keep him off the streets. "My mum caught it early and that definitely helped me out, because if she didn't, I probably would have been one of these people on the street just walking around aimlessly doing nothing all day," he says. "From when I was 19 to 21, I couldn't tell you exactly what I was doing because my mind was gone. "Art came to me. I would just draw more and more because I had nothing else to do and luckily I also had friends that came along at that time. His mum then gave him some money to spend on equipment. "I started drawing on a computer after that. That's when I started messing with Photoshop. That's when my mind started to come back. I started to realise what I could do." Although art seems to have paid off for Justin, he's still thinking whether being a full-time artist is a career he wants to stick with. "Right now I'm still finding out things about myself that I can do," he says. He's considering going into comics or maybe even designing for companies. But for now, he's still waiting to see where the success of Feels Like Summer can take him. For help and support on mental health visit the BBC Advice pages.